These are mostly fairly obscure, tiny ants that are seldom noticed. 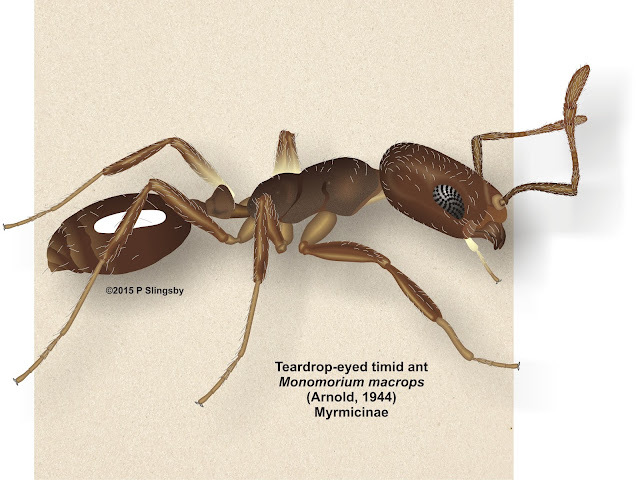 However, at least one species, Monomorium pharaonis (Pharoah ant) is a serious invader around the world, and has been found in the Cape, too [more below]. There are about 82 species in our region, many of which are quite obscure and seldom encountered. They all have tiny, ineffective stings [from a human point of view!] and, apart from the Pharaoh ant, live in tiny colonies that are seldom noticed. Very small, >2mm ants with [under magnification] large, teardrop-shaped eyes; evenly brownish-yellow all over with slightly darker gaster; small colonies of perhaps a few hundred individuals. These myrmicines have double-nodal petioles and naked pupae; twelve-segmented antennae [scape + 11] with a fairly prominent 3-segmented antennal ‘club’. Monomoriums do not have prominent propodeal spines but this species has two tiny bumps on the propodeum. This small [2.5 mm] ant occurs in leaf litter and under stones, in small colonies of perhaps a few hundred individuals with a single queen, who is about double the length of her workers. It could be confused with Argentine ants (Linepithema humile), but never runs in trails and, in contrast to the Argentines, is shy and retiring. It escapes eradication by Argentines by the simple means of ‘freezing’ when detected, and remaining motionless until the threat has passed. It can also be confused with Pheidole workers, but the absence of the huge-headed Pheidole majors in its nests gives it away. Technically it can be distinguished from other Monomoriums by [a] its uniform brown colour [with slightly darker gaster], and [b] a single pair of bristles on each petiole node, and two or three pairs of bristles on the trailing edge of the first gaster segment. At 3.5 – 4 mm this is the largest of the Western Cape’s Monomoriums. The ants are shy and often forage alone or in pairs, and occur in small colonies with a single queen. They are shiny dark brown to almost black and can be confused with Messor ants [but are all the same size, without major workers], Tetramorium [but do not have spines on the posterior of the thorax], or at a push with Pheidole [but they are larger and, once again, do not have majors]. Like all Monomoriums that have small stings but are too weak to penetrate human skin. They were first collected by Tucker and described by Arnold in 1926, from the summit of the Matroosberg at over 2000 m, but in 1928 were collected by Lockee-Bayne at Hermanus. Our specimen came from the very excellent Wild Olive Guest Farm, on the Goukou River near Stilbaai, showing that the ant has a fairly wide distribution. The Tiny yellow timid ant is about 1.5 mm long and occurs in leaf litter and dampish spots in buildings, under stones in the veld and even in the littoral zone at the coast. They have squarish heads with tiny, atrophied eyes that are only visible under magnification, and are overall yellow and almost transparent. They live in tiny colonies of a few dozen individuals, with a much larger queen up to about 4 mm long. These ants seem to be able to resist most invasive ants, but not much more is known about them; they are seldom noticed. First collected in Egypt in 1758, hence the name. 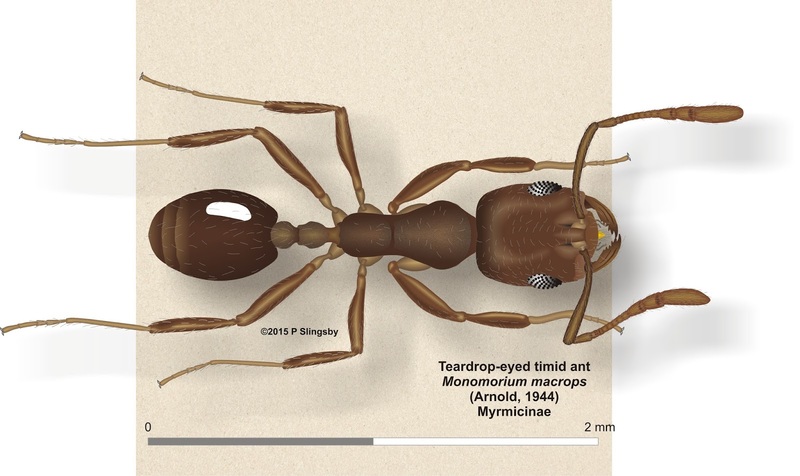 A seriously dangerous invader of temperate coastal regions around the world, the Pharaoh ant (Monomorium pharaonis) was collected in Cape Town by Mayr as early as 1862; he corrected Linnaeus’s name Formica pharaonis to Monomorium pharaonis. Despite that it is not very commonly seen in Cape Town any more, and it may be that it cannot survive competition from the later Argentine invader, Linepithema humile. It is still found on the mountain fringe in Bishopscourt, Constantia and Tokai. The ants are small [2+ mm] and yellowish to yellow-red, with the anterior of the gaster a darker brown. They live in very large colonies with several queens [who are up to about 5 mm long], and spread by colony budding, where queens run out with the workers and establish new nests at the food source. Although they have stings they cannot penetrate human skin, but that said they are much more aggressive than other Monomoriums and will swarm all over you if disturbed. [b] with magnification you can see that the club or thickened end of the antenna has three segments in Monomorium, but only two in Solenopsis.